Nils Lindberg - piano & arrangments, Sture Nordin - bass, Conny Svensson - drums. What a jazz-recording has to go through before it reaches the recording-studio is sometimes wearying and disappointing. This fact can particularly be applied to recordings of experimental jazz executed by commercially unknown artists. SAX APPEAL is just an example. The whole thing started during the summer 1959 with a telephone-call, a very common overture in the recording-business. Somebody, introducing himself as Mr. Lindberg, told me that a cousin of his, a pianist and arranger, had written some modern jazz-pieces for four saxes and rhythm-section. 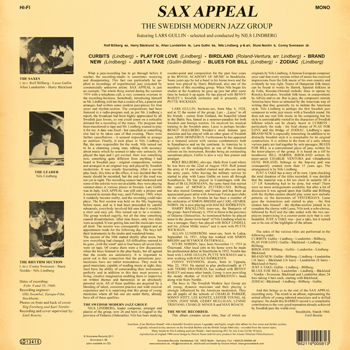 The compositions had been featured in a radio-program and, as per Mr. Lindberg`s report, the broadcast had been highly appreciated by all Swedish jazz lovers, so one could count on a noticable demand for a recording of the music. 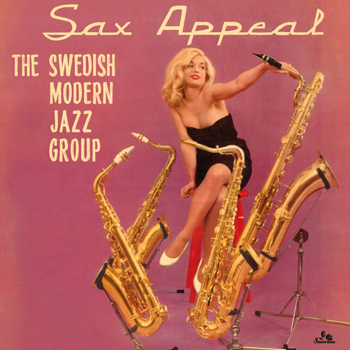 SAX APPEAL was still only a project and it seemed to remain that way, until February 1960, when it suddenly became reality, and the recording could take place. The result is an album, representing the united efforts of young talented musicians and a skilled engineer. No doubt this BARBEN record is a remarkable contribution to the very good reputation already achieved by Swedish jazz the world over. CURBITS is a colourful, very decorative flower which exists only in the naivistic, pictorial folklore of Dalecarlia. Nils wrote it already in 1954 for the band he led in Uppsala but made slight revisions of the arrangement for this session. The imaginative melody, played by the saxophones with Rolf Billberg`s alto on top, is actually based on the structure of an old, well-known folk song from the province of Värmland, south-west of Dalecarlia. The first jazz version of ACK VÄRMELAND DU SKÖNA was recorded in Stockholm, in 1951, by Stan Getz. Since then, Miles Davis and many others have played it, often under the name of DEAR OLD STOCKHOLM. The order of soloists is Gullin, Lindberg, Lundström and Billberg (who gives a hint of the folk melody for a brief moment at the end of his full chorus). PLAY FOR LOVE is built on the harmonic scheme of LOVER MAN, a favourite to generations of jazz singers and instrumentalists. Gullin, Bäcklund and Lindberg play 16 bars each, followed by half a chorus of the sax section, where Billberg makes some embroideries. BIRDLAND by Gene Roland (who, together with his schoolmate Jimmy Giuffre, is said to have invented the “Four Brothers-Sound” in the fourties) was written for the famous “Bop for the people” band that saxophonist Charlie Ventura led around 1950. Being, so to say, a 28 bar blues in ABBA form with a HONEYSUCKLE ROSE bridge, it is an effective vehicle for improvisation. Billberg opens with a phrase and a sound revealing his love for Lee Konitz, but immediately distinguishes his individuality with his strong emphasis on rhythm, his meaty sound and typical melodic lines. He is followed by Gullin, Lundström, Lindberg and Bäcklund respectively. BRAND NEW is one of the more thoroughly composed pieces from Lindberg`s first album. The sound is typical of Nils, pointing forward to his later works. Moreover, it hints at Nils` readiness to mix and combine different musical elements and colours: the rhythm gets a latin tinge when the tenor saxophonist trade bars (Lundström 16, Bäcklund 16, Lundström 8, Bäcklund 6) and it portends, not the least in Lundström`s opening statement, what would come a-year-or-so later when Stan Getz blended his tenor with the bossa nova rhythms of Brazil. The opening solos are by Gullin, Billberg and Lindberg. JUST A TAKE was made at the end of the date to fill out a playing-time too short for a 12inch LP; the format was, at this time, exceptional in Sweden, where the 7inch EP`s dominated. Lars Gullin chose the harmonic scheme of Jerome Kern`s YESTERDAY for improvisations by a quintet. Gullin starts off and is joined by the rhythm section half way through his chorus. After solos by Lindberg and Billber, the two saxophonists weave their lines together until the close of a great performance, rich in atmosphere. BLUES FOR BILL was developed from a riff played by trombonist Bill Harris on a Jazz at the Philharmonic recording. Billberg and Gullin step aside for the two-tenor team; the first solo is by Lundström, the second by Bäcklund and, finally, they alternate with four bars for two choruses, starting with Bäcklund. There is some earthy piano by Lindberg and solo spots for bassist Sture Nordin and drummer Conny Svensson, too. ZODIAC with its broad saxophone voicing and sparse but delicate counterpoint has, again, a flavour that is both Swedish and typical of Nils` music. It is his earliest composition in this collection, dating from 1953 (although the interlude was added for this session). Harry Bäcklund plays the opening solo, followed by Lindberg, Gullin and Billberg. Like Nils` other pieces, this combines the improvised and the orchestrated parts into a unified piece of art, which is actually what jazz composition is all about. NILS LINDBERG, leader composer, arranger and pianist of the group, now 26 and born in Gagnef in the province of Dalarna (Dalecarlia). Nils has been studying counter-point and composition for the past four years at the ROYAL ACADEMY OF MUSIC in Stockholm. Some years ago he led a band in his home town and the tenor was played by Harry Bäcklund, also one of the members of this recording group. When Nils began his studies at the Academy he gave up jazz but after some time he looked it up again. He has played with BENNY BAILEY`s Swedish orchestra and is presently with PUTTE WICKMAN. LARS GULLIN, baritone-sax, born May 4, 1928, and at 32 the nestor of the group. Lars - „Lasse“ to all his friends – comes from Gotland, the beautiful island in the Baltic Sea. He received his musical training in the Swedish army. Lasse is perhaps besides BENGT HALLBERG Sweden`s most famous jazz musician and has played with an other giant of Swedish jazz, ARNE DOMNERUS. Furthermore he has appeared as a featured soloist with various combinations both in Scandinavia and on the continent. In America he is regularly on the ranking-lists as one of the foremost soloists on his instrument, Besides being an outstanding saxophone-player, Gullin is also a very fine pianist and arranger. ROLF BILLBERG, alto-sax. Hails from Lund where he was born on the 22nd of August 1930. Rolf joined the army at 18 and studied clarinet and alto-sax during his army years. After leaving the military service he started to play with Lasse Gullin on tours all through Scandinavia. He has played in Copenhagen with the Band of IB GLINDEMANN, the same band that started the career of MONICA ZETTERLUND. Billberg has also toured Germany and France and has been an appreciated guest artist with American Forces jazz-clubs on the continent. In Sweden he has been a member of the orchestras of SIMON BREHM and CARL-HENRIK NORIN. He is now playing with HACKE BJÖRKSTEN. HARRY BÄCKLUND, tenor-sax, the Benjamin of the group – born February 6, 1936 in Mora in the province of Dalarna (Dalecarlia). As mentioned before he played tenor in the „home-town band“ of Nils Lindberg when he was a teenager. Harry has played with ROLF LINDELL and his „Glenn Miller music“ and is now with PUTTE WICKMAN. ALLAN LUNDSTRÖM, tenor-sax, born in Lulea, September 14, 1931. Allan has worked with SIMON BREHM and SEYMOUR ÖSTERWALL. STURE NORDIN, bass, born November 11, 1933 in Östersund. After local jobs in his home town he made his professional debut in Stockholm in 1952. Nordin has been with LASSE GULLIN, PUTTE WICKMAN and is now working with HACKE BJÖRKSTEN. CONNY SVENSSON, drums, born in Uppsala, May 22, 1934. He started to play professionally at 17 with THORE SWANERUD, has worked with BENNY BAILEY and many other bands. Conny is now providing the steady rhythm of HACKE BJÖRKSTEN`s band along witn Sture Nordin. The boys in The Swedish Modern Jazz Group are all young, dynamic musicians and their playing is strongly influenced by the American modernists. They are all pupils of the schools of CHARLIE PARKER, SONNY STITT, LEE KONITZ, LESTER YOUNG, AL COHN, ZOOT SIMS, GERRY MULLIGAN, LENNIE TRISTANO, CHARLIE MINGUS and MAX ROACH. Produced for reissue by Ekkehart Fleischhammer, album originally released in 1960 on Barben Records (Sweden) and Tempo Records (UK), bonus tracks from EP “Jazz In TV-Time” originally released on Columbia Records (Sweden), original recordings remastered by Jury Lutz (24 bit/ 48 khz), photos on front and back of cover by Stig Forsberg and Karl Nordin, supervised by Emil Bourin, original liner notes by Emil Bourin, additional notes by Lars Westin, reproduction of original 1960 cover design by Patrick Haase (rab-bit.net).